Sergeant Major Quick – Fix Bayonets! Now a point of clarification: in today’s parlance, the Old Breed refers to Marines of the 1st Marine Division who fought the island battle of Guadalcanal in World War II. To John Thomason and other Marines of his time, the term old breed referred to the Marines prior to World War I.
Additionally, Thomason’s reference to “leatherneck” refers to American and British Marines who wore a leather stock  around their necks (1798-1840, 1899-1902). One stock was issued to each Marine annually, and it is a tradition that continues today, represented by the standing collar of the Marine Corps dress blue uniform. Marines reintroduced the leather stock for use during the American-Philippine War (1899-1902) to protect against decapitation from Filipino machetes; in Thomason’s day, these were the old salts of the Corps. In Thomason’s view, Old Corps Marines stood head and shoulders above most of the soldiery of his day; he believed these old salts laid the foundation for what the Marine Corps would one day become. By passing these long-time traditions down from one generation of Marine to the next, the old breed of Marine became the cement of our tradition and the genesis of much of our lore. They served as models for such now-famous personages of World War II fame as John Basilone, Lou Diamond, and Bob McTureous. One of these old regulars was a man named John Henry Quick, whose exploits over more than 26 years of service would inspire the imaginations of many Marines after 1898. Quick was born in Charles Town, West Virginia in 1870. He enlisted in the U. S. Marine Corps on August 10, 1892 at Philadelphia, Pennsylvania, which made him a six year veteran by the time war broke out with Spain in 1898. During the morning of 14 June 1898, two companies of Robert W. Huntington’s battalion and fifty additional Cubans moved through the hills to seize Cuzco Well, the main water supply for the Spanish garrison at Guantanamo Bay, Cuba. The USS Dolphin (PG-24) moved east along the shore ready to furnish naval gunfire support upon call. The Spanish detected the Marines’ movements and alerted their main body near Cuzco Well. The Marines occupied the hill overlooking the enemy’s position, but were immediately exposed to long rifle fire directed upon them by the Spanish garrison. Captain George F. Elliott  signaled the Dolphin to shell the Spanish position, but because the sender of the message was not clearly visible to the ship, the vessel began dropping fire on a detachment of Marines who were en route to join the battle. As soon as the Dolphin answered his signal, Quick retrieved his service rifle and rejoined the firing line. Dolphin shifted her fire, and within a short time, the Spanish vacated their position. For Quick’s gallant and selfless conduct, Quick was awarded the Medal of Honor. During the Philippine-American War, Quick served as a Gunnery Sergeant under Major Littleton W. T. Waller and the campaign across Samar. During the Battle of Sohoton Cliffs, Quick’s direction of concentrated fires dislodged well-entrenched Filipino insurrectos, which enabled the Marines to capture the leading Filipino general and several of his lieutenants. During the military expedition to Vera Cruz (1914) Quick was again cited for valor during the assault of the city, for which he was commended by the Secretary of the Navy, as follows: “He was continually exposed to fire during the first two days of the operation and showed coolness, bravery, and judgment in the prompt manner in which he performed his duties. 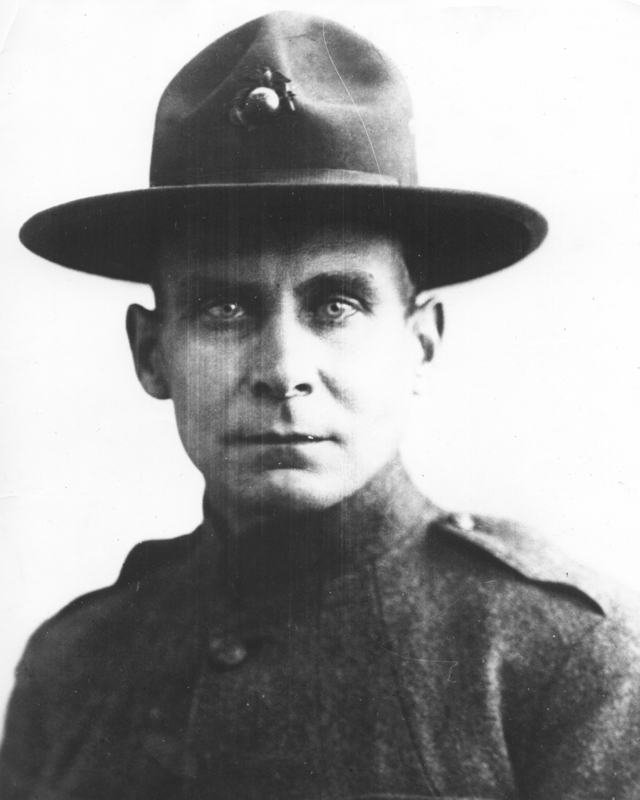 Sergeant Major John Quick sailed to France as part of the 6th Marine Regiment in 1917. During the Battle for Belleau Wood, Quick was awarded the Distinguished Service Cross and Navy Cross for delivery of much needed supplies over a fire-swept field. Quick continued to distinguish himself through every battle fought by the Marines in France, including Verdun, Aisne-Marne (Soissons), the Marbache Sector near Pont-a-Mousoon, the St. Mihiel Offensive, the Battle of Blanc Mont Ridge, and the Meuse-Argonne Offensive. Sergeant Major Quick was additionally awarded the 2nd Division Citation and the French fourragere of the Croix de Guerre. Sergeant Major Quick retired from active serve in November 1918, but was briefly recalled to active duty from July to September 1920. He passed away in St. Louis, Missouri on 9 September 1922. The stock, usually black, was a stiff leather collar measuring from 3 to 3 ½ inches in width and containing two metal clasps, worn around the neck. The device was designed with a two-fold purpose: its construction restricted movement and therefore improved the military bearing of Marines, and it protected the area of the neck and throat from blows of sword or thrust of dirk. *Being, as in the present tense — Once a Marine, Always** a Marine; and when I die, I’ll be a dead Marine. **Always — There are a few exceptions to the rule; John “I’d Sell My Soul If The Money’s Right” Murtha being one of them. Thank you for clarifying the specific reference of “the Old Breed” to that of the 1st Marines. Being just a civilian, I erroneously attached that term to all Marines of WWII. I also hope that Mr. Gunny was successful in his mission to model his character after the old Breed… not that all Marines haven’t, of course. Thank you for continuing to share your knowledge of USMC history and colorful standouts with us. So we know that the “leathernecks” had a vital purpose in 1900, and we know that these Marines persevered under the most trying circumstances. We must remember them, as you are doing here Mustang … we must make sure they are never forgotten. I am very late in commenting here. Not having been warned of my rights under Art. 31 of the UCMJ, I respectfully will provide no reason for my failure in this regard. Considering all that Mustang has done for the advancement of historical knowledge and general learning, I propose that a huge University be built with him in charge. Whaddya say? OK, I am kidding, but (however) not completely. Learning institutions, if led by people like Mustang…and with real teachers (again, like Mustang) would do our country a very great service. Unfortunately, most of our public schools are in the grip of the unions and politicians…and learning is very far down the real list of priorities. Since I am on a crazy roll here: Though I was opposed to the draft for a long time, how about we bring it back….and put every (EVERY) American youngster through Marine recruit training? We could skip the weapons training….just lean in hard on the “other stuff”…including all the good character building stuff….requiring them to learn lots of things in a very short period of time. And making right choices. Just a wild and crazy idea. Afterwards, they WOULDN’T be Marines, they would be sent home to get jobs and stay off welfare, drugs, sloth and criminality. OK, I am becoming a bit of a fascist here….but it would be better than the current situation. Just a little light hearted commentary. Right.